The Langwarrin Junior Football Club provides a safe and fun environment for all aspiring junior Aussie Rules Footballers. 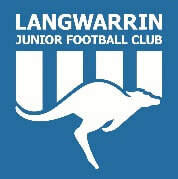 The Langwarrin Junior Football Club plays in the Frankston District Junior Football League. We have teams from Under 9's and all age groups up to and including the Under 17's competition. We have had a growing number of girls teams in the competition over the last two years and hope to have more for the 2019 season. Games are played on a Sunday at grounds from Mordialloc in the North to Mt Eliza in the south for teams up and inclusive of the Under 15's. The Under 16's & 17's can play games down on the Mornington Peninsula. The 2019 season will commence on Sunday 28 April and concludes on Sunday, 11 August. (There are breaks through out the season for school and public holidays.) Finals for Under 11's and above begin of Sunday, 18 August culminating in Grand Finals on Sunday, 1 September for those teams that qualify to play finals. The Langwarrin Junior Football Club encourages sponsors to get on board for season 2019. Our club had more than six hundred children registered for season 2018, therefore we need your help to provide them the best resources and facilities to enjoy the game they love. Our sponsorship co-ordinators, Brendan and Michael will be happy to discuss how you can support the club and players. Email sponsorship@langyjfc.com and they will be in contact with you. Various options are available to suit businesses or families who would like to support club, teams or individual players.